The Ben Franklin effect shows that people who have done us a favor see us in a better light. 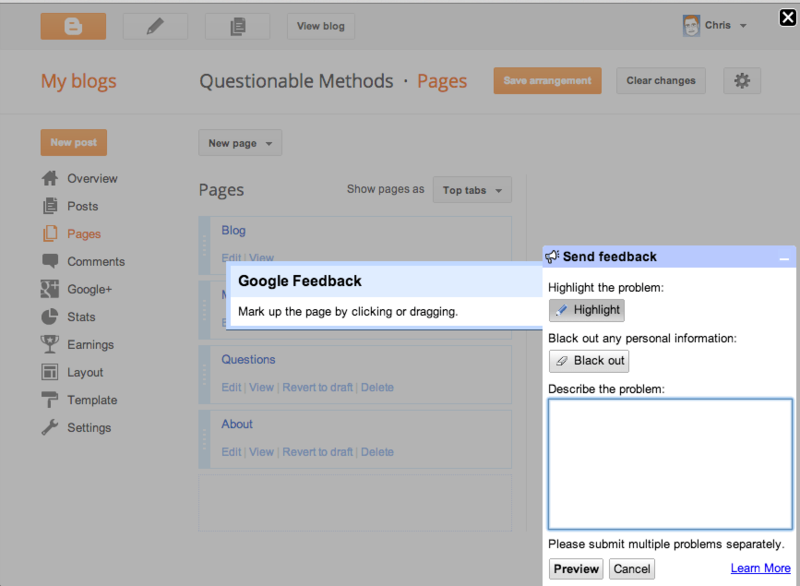 Blogger, the blog publishing tool owned by Google, have a simple “Send feedback” flash in the bottom right hand corner of each blog administration page. Clicking this flash opens a dialog box on the page, which has now become a highlightable image. Users can quickly show which area they are concerned about without knowing its technical name, and can easily remove personal information by blanking it out. After typing a short problem description and reviewing the information that will be sent, Google thanks users for their input. At this point, users who have submitted feedback will realize they have done Google a favor. It is likely that they will rationalize this dissonance and justify their continued use of the product they just complained about by liking it more. There is a sweet irony in the fact that when done correctly the act of reporting a bug – something that has just caused problems – has the potential to make customers like a company more than they did before. Reporting bugs on Blogger is interactive and relatively pain free. The Ben Franklin effect suggests that after successfully reporting the bug and being thanked, customers will like the company more. In his autobiography, Benjamin Franklin describes how he turned around the feelings of someone who had spoken up against him in the Pennsylvania State legislature. Having heard that he had in his library a certain very scarce and curious book I wrote a note to him, expressing my desire of perusing that book, and requesting he would do me the favour of lending it to me for a few days. He sent it immediately and I return’d it in about a week with another note, expressing strongly my sense of the favour. When we next met in the House he spoke to me (which he had never done before), and with great civility; and he ever after manifested a readiness to serve me on all occasions, so that we became great friends and our friendship continued to his death. Ask customers to do a small favor for you. Thank them for it once they are done, but don’t return the favor immediately. Now, having done an unreciprocated favor for you they must justify it to themselves by believing that they truly like you. Be sure that the favor is successfully completed. Without that, there will be no increase in liking. That suggests making the favor very easy to perform.